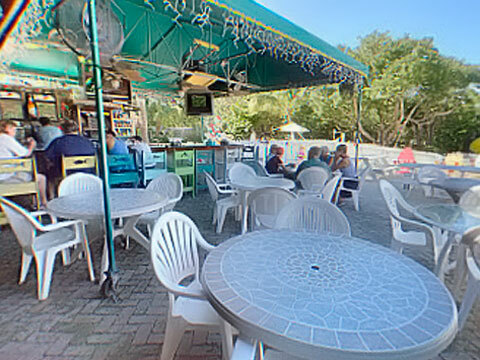 The Oceanview Pub has been a favorite of local residents, fishermen and charter boat captains for many years. It holds the very first liquor license issued in the Florida Keys. The Pub was starting to show it's age when the property was purchased by Gary and Dennis in 1996, so the old package store was dismantled, the bar was moved and enlarged, and new tables were added. The Pub's kitchen now offers a full late-night menu with everything from burgers and chicken wings to great fish sandwiches, chili, chowders and much more. There's even great daily home made lunch and dinner specials. And if you're looking for sports coverage, look no further. The Oceanview Pub has over 10 color TVs showing everything from baseball and basketball to Nascar and golf. And Sundays during football season, enjoy every NFL game on the schedule. Watching Monday Night Football at the Oceanview is a keys tradition. "Jocks on the Rocks," a live pre-game radio show gets things kicked off and there's drawings and drink specials throughout the game - even a free halftime buffet with a whole roasted turkey with fixin's. Combine that with great beverages, weekend entertainment and the coldest beer in town and you'll see why The Pub is Islamorada's favorite place for good food, fun and conversation. And you can enjoy it all either inside the Pub or outside on the back patio overlooking Florida Bay.